Publication History: This article was prepared especially for "Crain's Petrophysical Handbook" by E. R. (Ross) Crain, P.Eng. in 2005 based on Wikipedia content. This webpage version is the copyrighted intellectual property of the author. Although I learned all this in University 50 years ago, I can no longer recite any of it from memory. Therefore, the following is from Wikipedia http://en.wikipedia.org/wiki/Maxwell's_laws , with a little editing. If you don't have strong calculus skills, most of this material will be meaningless. Have fun! Symbols in bold represent vector quantities, whereas symbols in italics represent scalar quantities. The equations in this section, unless otherwise stated, are given in SI units. Unlike the equations of mechanics, Maxwell's equations are changed in other unit systems. Though the general form remains the same, various definitions get changed and different constants appear at different places. Two equivalent, general formulations of Maxwell's equations follow. The first separates free charge and free current from bound charge and bound current. This separation is useful for calculations involving dielectric and/or magnetized materials. The second formulation treats all charge equally, combining free and bound charge into total charge (and likewise with current). Of course, such an approach applies where no dielectric or magnetic material is present, and therefore no bound charge or current, but it also is a more fundamental or microscopic point of view. Maxwell's equations are generally applied to macroscopic averages of the fields, which vary wildly on a microscopic scale in the vicinity of individual atoms (where they undergo quantum mechanical effects as well). It is only in this averaged sense that one can define quantities such as the magnetic permittivity and magnetic permeability of a material. At the microscopic level, Maxwell's equations, ignoring quantum effects, describe fields, charges and currents in free space — but at this level of detail one must include all charges, even those at an atomic level, generally an intractable problem. where P and M are polarization and magnetization, and ρb and Jb are bound charge and current, respectively. Plugging in these relations, it can be easily demonstrated that the two formulations of Maxwell's equations given above are precisely equivalent. In order to apply Maxwell's equations (the formulation in terms of free charge and current, and D and H), it is necessary to specify the relations between D and E, and H and B. These are called constitutive relations, and correspond physically to specifying the response of bound charge and current to the field, or equivalently, how much polarization and magnetization a material acquires in the presence of electromagnetic fields. where ε0 and μ0 are two universal constants, called the permittivity of free space and permeability of free space, respectively. where ε and μ are constants (which depend on the material), called the permittivity and permeability, respectively, of the material. The history of the fields (the case of hysteresis, which occurs when ε and μ are functions of both present and past values of the fields). These are formally identical to the general formulation in terms of E and B (given above), except that the permittivity of free space was replaced with the permittivity of the material (see also displacement field, electric susceptibility and polarization density), the permeability of free space was replaced with the permeability of the material, and only free charges and currents are included (instead of all charges and currents). These equations have a solution in terms of traveling sinusoidal plane waves, with the electric and magnetic field directions orthogonal to one another and the direction of travel, and with the two fields in phase, traveling at the speed. which reduces to the electromagnetic wave equation due to an identity in vector calculus. The equation is satisfied in one dimension, for example, by a solution of the form E = E( x − c0t ), that is, by a solution that is unchanged when t advances to t + Δt at a position x that advances to x + c0 Δt. Maxwell discovered that this quantity c0 is the speed of light in vacuum, and thus that light is a form of electromagnetic radiation. The current SI values for the speed of light, the electric and the magnetic constant are summarized in the following table. Maxwell's equations of electromagnetism relate the electric and magnetic fields to the motions of electric charges. The standard form of the equations provide for an electric charge, but posit no magnetic charge. Except for this, the equations are symmetric under interchange of electric and magnetic field. In fact, symmetric equations can be written when all charges are zero, and this is how the wave equation is derived . If magnetic charges do not exist, or if they exist but where they are not present in a region, then the new variables are zero, and the symmetric equations reduce to the conventional equations of electromagnetism such as . Classically, the question is "Why does the magnetic charge always seem to be zero?" where q is the charge on the particle and v is the particle velocity. (It also should be remembered that the Lorentz force is not the only force exerted upon charged bodies, which also may be subject to gravitational, nuclear, etc. forces.) Therefore, in both classical and quantum physics, the precise dynamics of a system form a set of coupled differential equations, which are almost always too complicated to be solved exactly, even at the level of statistical mechanics. This remark applies to not only the dynamics of free charges and currents (which enter Maxwell's equations directly), but also the dynamics of bound charges and currents, which enter Maxwell's equations through the constitutive equations, as described next. Commonly, real materials are approximated as "continuum" media with bulk properties such as the refractive index, permittivity, permeability, conductivity, and/or various susceptibilities. These lead to the macroscopic Maxwell's equations, which are written (as given above) in terms of free charge/current densities and D, H, E, and B ( rather than E and B alone ) along with the constitutive equations relating these fields. For example, although a real material consists of atoms whose electronic charge densities can be individually polarized by an applied field, for most purposes behavior at the atomic scale is not relevant and the material is approximated by an overall polarization density related to the applied field by an electric susceptibility. Continuum approximations of atomic-scale inhomogeneities cannot be determined from Maxwell's equations alone. but require some type of quantum mechanical analysis such as quantum field theory as applied to condensed matter physics. See, for example, density functional theory, Green–Kubo relations and Green's function (many-body theory). Various approximate transport equations have evolved, for example, the Boltzmann equation or the Fokker–Planck equation or the Navier-Stokes equations. Some examples where these equations are applied are magnetohydrodynamics, fluid dynamics, electrohydrodynamics, superconductivity, plasma modeling. An entire physical apparatus for dealing with these matters has developed. A different set of homogenization methods (evolving from a tradition in treating materials such as conglomerates and laminates) are based upon approximation of an inhomogeneous material by a homogeneous effective medium (valid for excitations with wavelengths much larger than the scale of the inhomogeneity). Theoretical results have their place, but often require fitting to experiment. Continuum-approximation properties of many real materials rely upon measurement, for example, ellipsometry measurements. In practice, some materials properties have a negligible impact in particular circumstances, permitting neglect of small effects. For example: optical nonlinearities can be neglected for low field strengths; material dispersion is unimportant where frequency is limited to a narrow bandwidth; material absorption can be neglected for wavelengths where a material is transparent; and metals with finite conductivity often are approximated at microwave or longer wavelengths as perfect metals with infinite conductivity (forming hard barriers with zero skin depth of field penetration). And, of course, some situations demand that Maxwell's equations and the Lorentz force be combined with other forces that are not electromagnetic. An obvious example is gravity. A more subtle example, which applies where electrical forces are weakened due to charge balance in a solid or a molecule, is the Casimir force from quantum electrodynamics. The connection of Maxwell's equations to the rest of the physical world is via the fundamental sources of charges and currents and the forces on them, and also by the properties of physical materials. Although Maxwell's equations apply throughout space and time, practical problems are finite and solutions to Maxwell's equations inside the solution region are joined to the remainder of the universe through boundary conditions and started in time using initial conditions. In some cases, like waveguides or cavity resonators, the solution region is largely isolated from the universe, for example, by metallic walls, and boundary conditions at the walls define the fields with influence of the outside world confined to the input/output ends of the structure. In other cases, the universe at large sometimes is approximated by an artificial absorbing boundary, or, for example for radiating antennas or communication satellites, these boundary conditions can take the form of asymptotic limits imposed upon the solution. In addition, for example in an optical fiber or thin-film optics, the solution region often is broken up into subregions with their own simplified properties, and the solutions in each subregion must be joined to each other across the subregion interfaces using boundary conditions. Following are some links of a general nature concerning boundary value problems: Examples of boundary value problems, Sturm-Liouville theory, Dirichlet boundary condition, Neumann boundary condition, mixed boundary condition, Cauchy boundary condition, Sommerfeld radiation condition. Needless to say, one must choose the boundary conditions appropriate to the problem being solved. The formulation of Table 1 is assumed; that is, ρf is the "free" electric charge density (in units of C/m³), not including bound charge from the polarization of a material, and is the electric displacement field (in units of C/m²). For stationary charges in vacuum, the force exerted upon one point charge by another as found from Gauss's law is Coulomb's law. where, again, E is the electric field (in units of V/m), ρt is the total charge density (including bound charges). The formulation of Table 2 is assumed. which is Poisson's equation in the case where ε is independent of position (that is, when the material is homogeneous). The formulation of Table 1 is assumed. That is, the bound charge is subsumed under the permittivity, and only the free charge is explicit on the right side of the equation. where is the magnetic B-field (in units of tesla, denoted "T"), also called "magnetic flux density", "magnetic induction", or simply "magnetic field". It is interpreted as saying there is no "magnetic" charge that is the analog of the electric charge, and often this equation is referred to as "the absence of magnetic monopoles". Differently put, the basic entity for magnetism is the magnetic dipole, which orients itself in a magnetic field. where is an infinitesimal vector corresponding to the area of a differential square on the surface S with an outward facing surface normal defining its direction. Like the electric field's integral form, this equation works only if the integral is done over a closed surface. This equation is related to the magnetic field's structure because it states that given any volume element, the net magnitude of the vector components that point outward from the surface must be equal to the net magnitude of the vector components that point inward. Structurally, this means that the magnetic field lines must be closed loops. Another way of putting it is that the field lines cannot originate from somewhere; attempting to follow the lines backwards to their source or forward to their terminus ultimately leads back to the starting position. Hence, the above reference to this law as saying there are no magnetic monopoles. This equation is usually referred to as "Faraday's law of induction", but in fact it is only a restricted form of Faraday's law; for example, it doesn't apply to situations involving motionally induced EMF. where is the magnetic field strength (in units of A/m), related to the magnetic flux density by a constant called the permeability, μ ( ), and J is the current density, defined by: where is a vector field called the drift velocity that describes the velocities of the charge carriers which have a density described by the scalar function ρq. The second term on the right hand side of Ampère's Circuital Law is known as the displacement current. It was Maxwell who added the displacement current term to Ampère's Circuital Law at equation (112) in his 1861 paper On Physical Lines of Force. 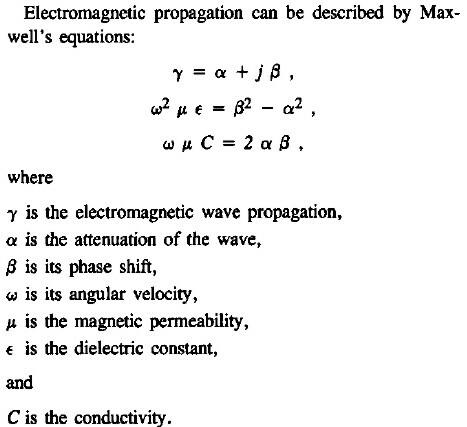 Maxwell used the displacement current in conjunction with the original eight equations in his 1865 paper A Dynamical Theory of the Electromagnetic Field to derive a wave equation that has the velocity of light. Most modern textbooks derive this electromagnetic wave equation using the 'Heaviside Four'. is displacement current. The displacement current concept was Maxwell's greatest innovation in electromagnetic theory. It implies that a magnetic field appears during the charge or discharge of a capacitor. If the electric flux density does not vary rapidly, the second term on the right hand side (the displacement flux) is negligible, and the equation reduces to Ampere's law. expression above. For example, here the magnetic field has the same units as the electric field . Maxwell's equations have a close relation to special relativity: Not only were Maxwell's equations a crucial part of the historical development of special relativity, but also, special relativity has motivated a compact mathematical formulation Maxwell's equations, in terms of covariant tensors. is the magnetizing field, which Maxwell called the "magnetic intensity". is the electric current density (with being the total current including displacement current). is the displacement field (called the "electric displacement" by Maxwell). ρ is the free charge density (called the "quantity of free electricity" by Maxwell). is the magnetic vector potential (called the "angular impulse" by Maxwell). is called the "electromotive force" by Maxwell. The term electromotive force is nowadays used for voltage, but it is clear from the context that Maxwell's meaning corresponded more to the modern term electric field. 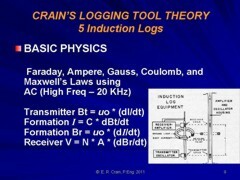 Φ is the electric potential (which Maxwell also called "electric potential"). σ is the electrical conductivity (Maxwell called the inverse of conductivity the "specific resistance", what is now called the resistivity). It is interesting to note the term that appears in equation D. Equation D is therefore effectively the Lorentz force, similarly to equation (77) of his 1861 paper (see above). When Maxwell derives the electromagnetic wave equation in his 1865 paper, he uses equation D to cater for electromagnetic induction rather than Faraday's law of induction which is used in modern textbooks. (Faraday's law itself does not appear among his equations.) However, Maxwell drops the term from equation D when he is deriving the electromagnetic wave equation, as he considers the situation only from the rest frame.